USA Hockey defines the age ranges for RWB/8U, Squirt/10U, Peewee/12U, Bantam/14U and Midget/18U. The RWB, Squirt and Peewee teams are co-ed. Checking begins at age 13/Bantam and advanced skating skills are required for Bantam and Midget play. The Empire Program will begin in September after Labor Day and run through mid-March for one fee. Evaluations occur in April every year. While attendance at the evaluations is not required, players who do not attend may be placed on any team with space available. 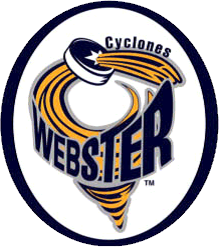 The majority of practices and home games are scheduled at Webster Ice Arena. Other ice arenas within the Rochester area may be used for practices and home games when ice availability is limited. Players in this program will skate an average of twice per week at various times. Generally players should expect one practice on weekdays and game(s) on weekends. Depending on ice availability, some practices may be on the weekends. Opportunities for clinics and off ice training will be available. Teams will compete with other area organizations in the Empire Amateur Hockey Conference (EAHC). RWB/8U teams play a 14 game season, Squirt/10U and Peewee/12U teams play a 16 game season, Bantam/14U play a 18 game season and Midget/18U play a 20 game season. Half of the games will be home games and half will be away games at rinks in the greater Rochester area. A pair of hockey socks and a jersey are supplied as part of the Registration fee. Participants are required to supply full hockey equipment including a certified hockey helmet with face mask, a neck guard, mouth guard, shoulder pads, elbow pads, hockey gloves, hockey pants, shin guards, single blade hockey skates and an ice hockey stick. Empire fees do not include Tournaments and other team activities (ex: team parties). Most Empire teams play in 2 to 3 Tournaments and parents should expect to discuss the locations and costs for these activities at the initial parent meeting with their team's coach. Registration opens in early June and players should register as early as possible as we will close divisions as they fill. All discounts and the $150 fee paid at Evals/Tryouts have been already factored into the fees shown. Players will not be drafted onto a team and may not participate in any team activities until they have registered and paid. RWB/8U is CLOSED - all 5 teams are full. Players interested in playing on a Squirt/10U, Peewee/12U, Bantam/14U or Midget/18U team should contact either registrar@wyha.com -OR- house@wyha.com for placement and so Registration is re-opened. Midget Registration is open for players who have petitioned and been approved! Empire Squirt Red: Only players who have tried out for and been notified they made the team should register for this option. All other Squirt players (and RED alternates) should register using one of the "Empire Squirt" options. $150 Payment at Tryouts/Evals NOTE: All fees in this registration assume $150 was paid at Tryouts or Evals. Players who did not pay this fee by May 31 should the check option "I have not paid the $150" and $150 will be added to their fee. Use the Registration below to register for Empire House Teams (other Programs have separate registrations).